New boss Simon Davey made a good start as Darlington secured victory at Burton to retain their slim survival hopes. Burton's Greg Pearson hit the post inside two minutes, but Darlington took the lead thanks to a superb left-foot shot from Josh Gray after 22 minutes. Alan White headed the second from Gary Smith's corner 10 minutes later. The visitors were good value for their lead and could count themselves unlucky when Pearson reduced the deficit from the penalty spot. "I think we got what we deserved which was nothing. We just didn't perform well. "We were flat, our passing was poor, we didn't keep possession, we didn't have that intensity, we didn't have that tempo, it was just an all round poor game." 90:00+4:20 Tadgh Purcell fouled by Tom Parkes, the ref awards a free kick. Free kick taken by Mark Convery. 90:00+3:23 Josh Gray fouled by Cleveland Taylor, the ref awards a free kick. Shane Redmond takes the direct free kick. 90:00+2:56 A cross is delivered by Paul Boertien. 90:00+2:28 Josh Gray takes a shot. Save made by Artur Krysiak. 90:00+1:55 Steven Kabba takes a shot. Comfortable save by Shane Redmond. 90:00+0:48 Gary Smith concedes a free kick for a foul on Michael Simpson. Paul Boertien takes the free kick. 89:33 Foul by Cleveland Taylor on Josh Gray, free kick awarded. Alan White takes the direct free kick. 88:33 Chris Moore gives away a free kick for an unfair challenge on Greg Pearson. The free kick is delivered right-footed by Cleveland Taylor from left wing, Shane Redmond makes a save. 87:44 Substitution Mark Convery joins the action as a substitute, replacing Curtis Main. 86:08 Unfair challenge on Tom Parkes by Josh Gray results in a free kick. Artur Krysiak takes the free kick. 85:30 Chris Moore crosses the ball. 85:16 Gary Smith crosses the ball, Tom Parkes manages to make a clearance. 82:33 Steven Kabba produces a right-footed shot from just outside the box that goes wide left of the goal. 80:34 Russell Penn fouled by Gary Dempsey, the ref awards a free kick. Tony James takes the direct free kick. 79:51 Cleveland Taylor produces a cross, Andrew Milne gets a block in. Correction - 77:50 A cross is delivered by Cleveland Taylor. 77:50 Cleveland Taylor crosses the ball. 76:21 The ball is swung over by Cleveland Taylor. 76:07 A cross is delivered by Keith Gilroy, clearance by Chris Moore. 75:55 The ball is delivered by Russell Penn, clearance made by Alan White. 75:48 Cleveland Taylor produces a cross, clearance by Ian Miller. 75:35 Corner taken by Cleveland Taylor from the right by-line. 75:23 Steven Kabba takes a shot. Shane Redmond makes a save. 74:04 Outswinging corner taken right-footed by Cleveland Taylor from the right by-line, Greg Pearson has a headed effort at goal from deep inside the area missing to the right of the goal. 73:37 Outswinging corner taken by Cleveland Taylor, Alan White makes a clearance. 73:26 Centre by Keith Gilroy, Paul Arnison makes a clearance. Correction - 71:46 Gary Smith produces a cross, free kick awarded for a foul by Tadgh Purcell on Paul Boertien. Artur Krysiak takes the direct free kick. 71:46 Substitution Keith Gilroy comes on in place of John McGrath. 71:46 The ball is swung over by Gary Smith, Unfair challenge on Paul Boertien by Tadgh Purcell results in a free kick. Artur Krysiak takes the direct free kick. 71:07 The ball is delivered by Cleveland Taylor, save made by Shane Redmond. 69:23 Russell Penn sends in a cross, clearance made by Ian Miller. 68:46 The ball is swung over by Steven Kabba. 68:19 Andrew Milne is flagged offside by the assistant referee. Indirect free kick taken by Artur Krysiak. 67:08 The ball is delivered by Cleveland Taylor. Correction - 65:49 Free kick awarded for a foul by Tadgh Purcell on John McGrath. Cleveland Taylor takes the direct free kick, Headed effort from deep inside the penalty area by Greg Pearson misses to the left of the goal. 65:49 Foul by Tadgh Purcell on John McGrath, free kick awarded. Free kick taken by Cleveland Taylor. 63:50 Corner taken left-footed by John McGrath, Tadgh Purcell manages to make a clearance. 62:33 Substitution (Burton Albion) makes a substitution, with Steven Kabba coming on for Shaun Harrad. 61:58 Shaun Harrad takes a shot. Alan White gets a block in. 60:44 Corner taken right-footed by Cleveland Taylor from the left by-line, Alan White manages to make a clearance. 60:20 Corner taken by John McGrath played to the near post, clearance by Gary Smith. 59:58 Free kick awarded for an unfair challenge on Andrew Corbett by Curtis Main. Direct free kick taken by Tony James. 57:19 Unfair challenge on Josh Gray by John McGrath results in a free kick. Shane Redmond restarts play with the free kick. 57:00 Outswinging corner taken right-footed by Cleveland Taylor from the right by-line, clearance by Ian Miller. 56:45 A cross is delivered by Russell Penn, Alan White makes a clearance. 56:31 The ball is sent over by Greg Pearson, Alan White manages to make a clearance. 55:38 Inswinging corner taken right-footed by Gary Smith from the left by-line to the near post, Tom Parkes makes a clearance. 55:18 Free kick awarded for an unfair challenge on Gary Smith by Michael Simpson. Alan White takes the direct free kick. 54:52 Unfair challenge on Alan White by Greg Pearson results in a free kick. Alan White takes the direct free kick. 53:58 Shot from long distance by Andrew Corbett goes wide of the left-hand upright. 53:50 The ball is swung over by John McGrath, blocked by Ian Miller. 51:23 Tadgh Purcell fouled by Tom Parkes, the ref awards a free kick. Paul Arnison restarts play with the free kick. 50:41 Andrew Corbett produces a cross, Shaun Harrad takes a shot. Save by Shane Redmond. 49:54 Artur Krysiak takes the free kick. 49:54 Booking Curtis Main is cautioned by the ref for unsporting behaviour. 49:46 Free kick awarded for an unfair challenge on Artur Krysiak by Curtis Main. 49:07 Corner taken by Gary Smith from the right by-line, Ian Miller takes a shot. Artur Krysiak makes a save. 47:40 Outswinging corner taken right-footed by Gary Smith from the right by-line, Ian Miller takes a shot. 47:33 Chris Moore crosses the ball, Paul Boertien gets a block in. 47:23 The ball is swung over by Gary Dempsey. 46:28 Free kick awarded for an unfair challenge on Josh Gray by Michael Simpson. Gary Smith takes the direct free kick. Correction - 45:46 The assistant referee flags for offside against Shaun Harrad. Shane Redmond restarts play with the free kick. 45:46 The referee blows for offside. Shane Redmond takes the free kick. 45:26 Andrew Corbett fouled by Tadgh Purcell, the ref awards a free kick. Artur Krysiak restarts play with the free kick. 45:00+2:40 The referee blows for half time. 45:00+2:22 Shaun Harrad takes a shot. Shane Redmond makes a comfortable save. 45:00+1:42 Shaun Harrad has an effort at goal from outside the penalty box which goes wide left of the goal. 45:00+0:38 GOAL - Greg Pearson:Burton Albion 1 - 2 Darlington Power penalty scored by Greg Pearson. Burton Albion 1-2 Darlington. 43:56 Foul by Alan White on Greg Pearson, Penalty awarded. 43:21 Shaun Harrad produces a cross, save by Shane Redmond. 42:17 Gary Dempsey is caught offside. Free kick taken by Artur Krysiak. 39:32 Tony James takes the direct free kick. 39:32 Booking Caution for Gary Dempsey. 39:20 Gary Dempsey gives away a free kick for an unfair challenge on Greg Pearson. 38:19 Foul by Shaun Harrad on Paul Arnison, free kick awarded. Shane Redmond restarts play with the free kick. 38:02 Russell Penn takes a shot. 37:43 Outswinging corner taken from the right by-line by Cleveland Taylor, clearance by Andrew Milne. 37:16 The ball is sent over by Cleveland Taylor, Russell Penn takes a shot. Save made by Shane Redmond. 36:31 Shaun Harrad takes a shot. Save made by Shane Redmond. 34:03 Artur Krysiak restarts play with the free kick. 34:03 Substitution (Burton Albion) makes a substitution, with Michael Simpson coming on for Jimmy Phillips. 34:03 Corner from the left by-line taken by Gary Smith, Unfair challenge on Artur Krysiak by Josh Gray results in a free kick. 33:58 Chris Moore sends in a cross, clearance made by Tony James. 33:17 The assistant referee flags for offside against Shaun Harrad. Indirect free kick taken by Shane Redmond. 32:47 Unfair challenge on Greg Pearson by Alan White results in a free kick. Direct free kick taken by Cleveland Taylor. 31:13 The assist for the goal came from Gary Smith. 31:13 GOAL - Alan White:Burton Albion 0 - 2 Darlington Alan White finds the back of the net with a headed goal from inside the six-yard box. Burton Albion 0-2 Darlington. 28:09 The ball is sent over by Josh Gray, Shot by Gary Dempsey from deep inside the penalty area misses to the left of the goal. 27:32 Andrew Corbett gives away a free kick for an unfair challenge on Josh Gray. Shane Redmond takes the free kick. Correction - 26:29 Centre by Chris Moore, Andrew Corbett makes a clearance. 26:29 The ball is delivered by Chris Moore, clearance made by Tony James. 25:21 Chris Moore produces a cross, Andrew Corbett makes a clearance. 24:14 The ball is crossed by Andrew Milne, clearance by Tom Parkes. 21:16 The assist for the goal came from Curtis Main. 21:16 GOAL - Josh Gray:Burton Albion 0 - 1 Darlington Josh Gray finds the back of the net with a goal from the edge of the penalty box to the top left corner of the goal. 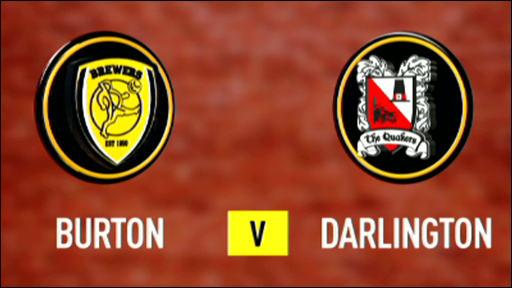 Burton Albion 0-1 Darlington. 20:15 Outswinging corner taken from the right by-line by Cleveland Taylor. 20:04 The ball is delivered by Cleveland Taylor, Andrew Milne gets a block in. 19:09 Curtis Main is ruled offside. Artur Krysiak takes the free kick. 18:51 Jimmy Phillips gives away a free kick for an unfair challenge on Chris Moore. Gary Dempsey takes the free kick. 15:23 Cleveland Taylor takes a inswinging corner from the left by-line played to the near post, clearance by Andrew Milne. 15:13 Greg Pearson sends in a cross, clearance made by Alan White. Correction - 13:50 Foul by Paul Boertien on Paul Arnison, free kick awarded. Free kick crossed left-footed by Josh Gray from right wing, clearance made by Tom Parkes. Unfair challenge on Cleveland Taylor by Curtis Main results in a free kick. Direct free kick taken by Artur Krysiak. 13:50 Foul by Paul Boertien on Paul Arnison, free kick awarded. Free kick taken by Gary Smith. 12:34 The ball is crossed by Jimmy Phillips, Alan White manages to make a clearance. 11:17 Centre by Chris Moore, Gary Smith produces a header from deep inside the six-yard box that clears the bar. 11:06 Foul by Russell Penn on Gary Dempsey, free kick awarded. Gary Smith takes the free kick. 9:12 Free kick awarded for a foul by Andrew Corbett on Josh Gray. Direct free kick taken by Gary Smith. 7:43 Centre by Cleveland Taylor, Effort on goal by Russell Penn from just outside the area goes harmlessly over the target. 7:28 Gary Smith concedes a free kick for a foul on Cleveland Taylor. Direct free kick taken by John McGrath. 7:09 Chris Moore gives away a free kick for an unfair challenge on Tony James. Artur Krysiak restarts play with the free kick. 6:06 Free kick awarded for a foul by Shaun Harrad on Andrew Milne. Direct free kick taken by Alan White. 5:04 Greg Pearson takes a shot. Save made by Shane Redmond. 4:43 Ian Miller produces a cross, Artur Krysiak makes a save. 3:31 Andrew Corbett delivers the ball, Alan White makes a clearance. 2:05 Free kick taken by John McGrath. 2:05 Booking Gary Smith is given a yellow card. 1:21 Unfair challenge on Russell Penn by Gary Smith results in a free kick. 1:10 Effort from close in by Greg Pearson strikes the post. 0:45 Ian Miller concedes a free kick for a foul on Jimmy Phillips. Free kick taken by Paul Boertien.